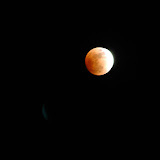 If it wasn't so cold out side I would have been able to take more pictures of the lunar eclipse. The camera was lightly shaking while on the tripod making this shot more difficult. These photos were taken with a Nikon D70 with a 300mm telephoto lens. I have found myself getting into pepsi and coke points in terms of song downloads. I can't say with one is the best but they both have their perks. Pepsi does not offer as nearly as many points Pepsi has picked Amazon as their music store choice. Amazon uses DRM free MP3s compared to Cokes choice of Rhapsody which uses a format .rax. Real Audio format can not be used on players and devices other then their own. Rhapsody on the plus side is giving you cash value credit which you ca use to buy albums. Coke offers more points but to use the songs on a media player you have to burn them to CD as seen by this message. Thank you for contacting us regarding the My Coke Rewards Loyalty Program. Your question is very important to us. Thank you for your feedback and we apologize for the inconvenience. Should you need any additional clarification, or have any other questions regarding this program, please do not hesitate to contact us. > something other then a Windows desktop? > Trevor: Hello. Welcome to Real's Live Chat. How can I help you? > Trevor: Please give me a couple of minutes while I check your account. > Trevor: Sorry for delay in reply as I was working in your issue. > Trevor: Thanks for your patience. > Trevor: Patrick, Rhapsody tracks are secured .rax format tracks. > Trevor: You cannot have them in other formats. > only have in secured .rax format. > Trevor: You can burn the purchased tracks in your CD's as .CDA format. > CD under the Free account? > Trevor: After purchase, you can burn them without extra cost. > Trevor: Is there anything else that I can help you with today? > assisting you, and I hope you were satisfied with the experience!